During the reign of Prince Josef Johan Adam of Liechtenstein (1721-1732) the residence at Valtice was the most important family architectural work. 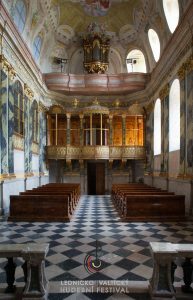 The Baroque chapel which forms part of the Castle is one of the most beautiful in the Czech Republic. This baroque jewel was built in the years 1726-1729 by Antonio Beduzzi, who was at that time the Court Architect of the Princes of Liechtenstein. This renowned Italian architect followed the work of Anton Ospel. He designed not only the chapel itself, but also the decorative frescoes, which he combined harmoniously with the sculptural interior decor. In 1728, a unique organ, the largest preserved work of the Viennese master Walter was installed in the chapel. Even after nearly three centuries, its unique sound is reminiscent of the Lichtenstein Princes’ significant efforts to link art and faith in their lives. 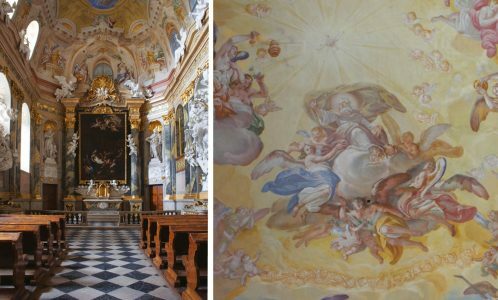 The altar piece showing the Adoration of the Shepherds is a copy of the work of Bolognese painter Guido Reni, and illustrates the string influence of Bolognaise artistic tradition on transalpine interior architecture in the first quarter of the 18th century. Valtice chapel is undoubtedly one of the most valuable examples of Central European Baroque art.